The Wraithwhispers are a clan I’ve written for over the years, and I’m making this post as a nice way to compile and share all of the information on them on the off-chance you would like your Aurin to have interacted with the clan in their history, or for anyone pouring over old documentation to learn more about them among the numerous weird clan practices from clans across Arboria. If you really don’t care about any of this and just came for the pictures that’s cool too. 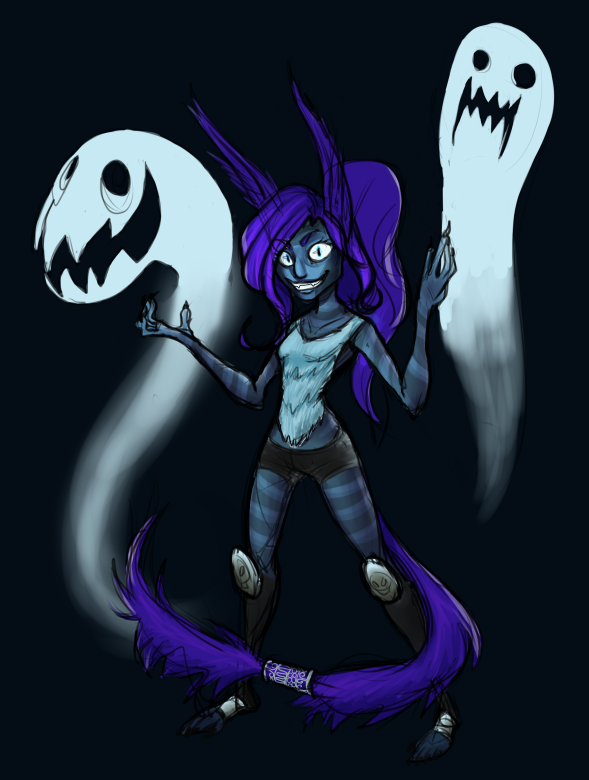 Among Aurin, Clan Wraithwhisper is best known for three things: A natural attunement to the spirits of the deceased, their intricate Spiritwood jewelry, and being a little... weird. Their village is nestled in the heart of Wraithwhisper Hollow, a swath of forest thick enough to hide the sky, where rain and fog seem to be the only weather they know. The central facet of their life is the Wraith, a creature within their land they seemingly revere- it’s present in almost every aspect of their culture. But we’ll get to that later. The Hollow sits in the valley of a mountainous Wikren region, sheltered from the seasons and instead blessed with continuous rainfall, making for a very wet, verdant forest. Many areas of the Hollow are flooded. With the constant combination of water and rot, the farming areas they’ve managed to establish can grow just about anything they’re able to trade in from neighboring villages. Fauna comes in wide varieties, and the Hollow isn’t necessarily a safe place to live. Even with the Wraith’s ever-watchful eyes, it’s often that an Aurin has fallen victim to predation. Their buildings are often focused in the dryer areas, with walkways woven across the water by slow, careful manipulation of roots over the years. The majority of their housing is also wood-woven and built to raise with water levels, bound by roots to keep from moving too far with the yearly floods. Almost all Wraithwhispers have skin that seemingly resembles patterns from the sky, whether it’s the dark, swirling patterns of a galaxy, the subtle mottling of a cloudy day, or the vibrant gradation of a sunset. While the Wraithwhispers themselves attribute this as a blessing of the Wraith, more scientific-minded individuals have surmised it was actually an adaptation for attracting a mate from outside clans. 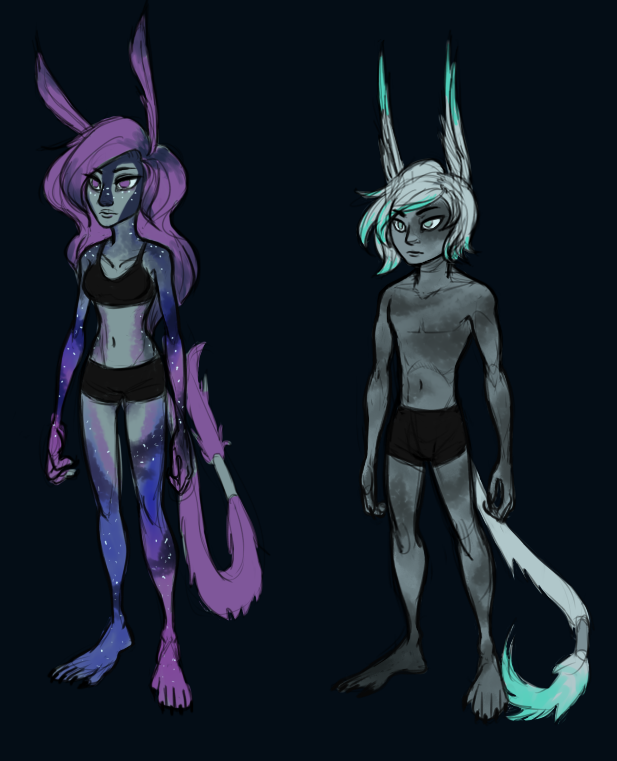 The only exception to this are the Matrias, who have slate gray skin with no markings whatsoever. The clan attributes this to the next in line being ‘chosen’ and seems to occur rarely throughout the clan females regardless of the parents. The child is guaranteed to be the next clan leader. Their fur and hair have a natural oil that helps them shed water easily, and they have slight webbing between their fingers and toes to help them in the areas that flood frequently. Aside from that, they’re very much like the average Aurin. The last known Matria of the Wraithwhispers, Aurystis. Status: Deceased. Clan roles among the Wraithwhispers aren’t much different from other clans. They have the Matria and her Consorts, Hunters, and Tenders, which generally function as one would expect. They differ by having a few extra roles, being Wardens, Speakers, and Rootweavers. Wardens: Wardens are a more localized version of Watchers, patrolling only the territory of Wraithwhisper Hollow in order to make sure everything is running smoothly. This involves watching for natural anomalies and either reporting or correcting them, maintaining a healthy flora/fauna population, and keeping an eye on strangers within the Hollow. Speakers: Speakers have a very special job- communing with the Wraith. There are only two to three Speakers at any given time within the clan, and they spend the majority of their time preserving the history of their clan through speaking with the Wraith and recording the goings-on of the clan. A Speaker being kind of creepy. Rootweavers: A group often comprised of elder Aurin too old to participate in the more physical duties, Rootweavers are highly honored members of the clan responsible for the creation of Spiritwood jewelry, including the tailcuffs. A Rootweaver hard at work. In the very beginning of their clan, there was a single group- the Gladesingers, a harmonious, heavily traditional clan that valued life above all else and saw the Weave as music, referring to it as the Song. Their society was near-utopian, and others often came to them for spiritual advice or healing. The mythos the Wraithwhispers like to tell is that a Gladesinger Matria-to-be fell in love with a Tender. The Tender died after a gruesome accident. In her grief, the Consort defied Gladesinger tenets and sacrificed herself to bring him back in a carefully constructed ritual. They both came back, a grotesque amalgamate of their bodies and souls intertwined. Ecstatic about their success, the amalgam rushed home to celebrate, only to be met with disgust from their families. The Gladesingers refused to do them any harm, but wouldn’t take them in anymore. Exiled from their home, they left with those who supported their beliefs and accepted their new form. For a while, they adjusted to their new form and lived amongst the others as a friend. They were dubbed ‘The Wraith,’ and in their vow of leaving the Song behind forever, became the Wraithwhispers. When the first exile died, the entire group fell into a state of panic- especially the amalgam, who was now carrying the added spirit of the fallen. This began to happen with every member of the group who died, until it became an accepted and normal thing. The deaths of families were no longer mourned, but celebrated. Nobody ever left the clan or their loved ones, and were always available to contribute their wisdom and help to the group. Clan life slowly melded around the Wraith, and ghosts became average to the Wraithwhispers. The Wraith became their replacement for the Weave, and they held its wisdom as highly as they would from any Elder Tree. They took on a strong appreciation for the macabre, finding a grim humor in decorating the village with the bones of the deceased, of both their clan and the beasts they hunted. As more souls joined it, the burden of sustaining itself forced it to follow the Matria- who would benefit most from speaking with it. 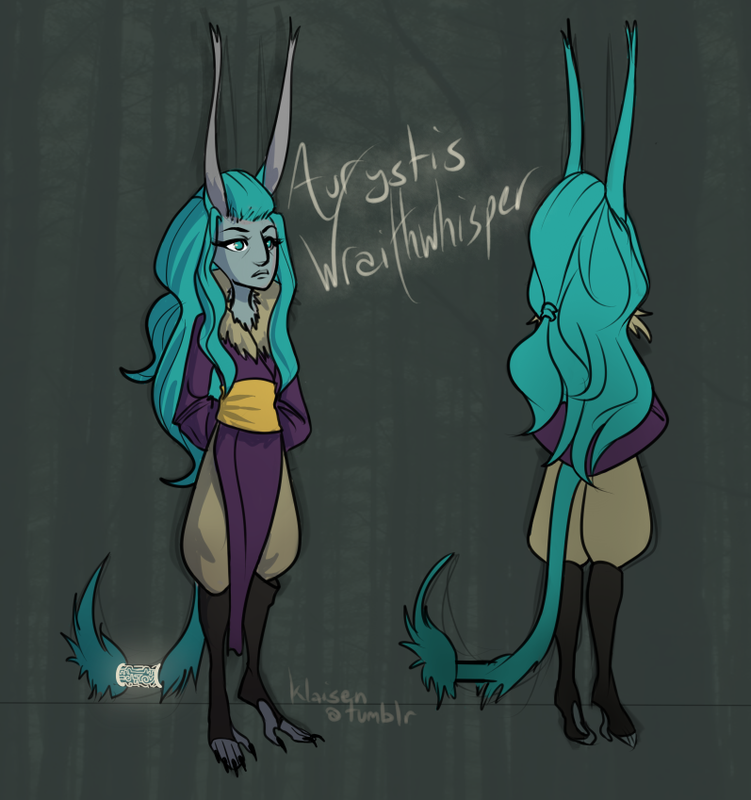 The Speakers came into existence to support the Wraith as well, becoming Aurin specialized in deciphering the ceaseless cacophony of voices that centuries of dead Aurin turned into. As the centuries went on, the Wraith became harder to speak with as an individual. Though members of the clan would often catch glimpses and could occasionally have a conversation with a loved one- as fleeting and confused as it was. 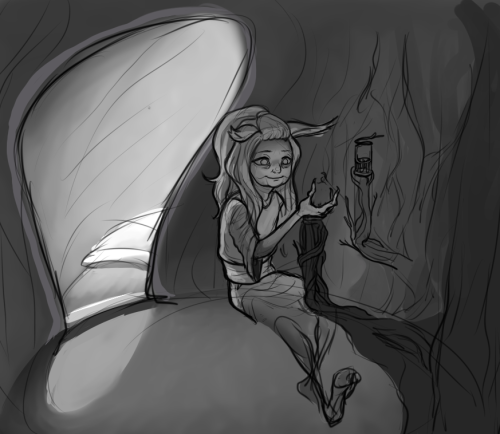 Thank you for reading, this is still a WIP! After sitting on this for months I figure I might as well post what I have. Next to come: Details on culture and the storyline now. Anyway, I've always loved the concepts around this group, you've done an amazing job with them! I need to figure out how to condense stuff like this. I just keep writing and writing then never finish. Aaah, thank you! I've had a lot of fun playing with all the leeway that Aurin lore has to offer and trying to make them an interesting clan. Oh man, I really wonder how that would play out! I feel bad that we've both been around for so long but I've never had any of mine meet any of yours. I feel you, man. I have so much I haven't posted anywhere just because it's not done. With this, at least, I could focus on 'What do people need to know or would know about this clan already?' and I could work from there to narrow down what was important to have. I know, right? But, given the natures of both...I'm not overly surprised either. Kali is scary accurate for one the Wraithwhisper Matria's even...now -that- is some weird juju! Oh jeez, you're totally right! That'd throw them off something fierce, especially since most of the survivors haven't actually met many gray aurin.